Cheering peers surrounded Dohn’s Main Campus Honor Roll students at this morning’s Honor Roll Ceremony. A remarkable 15% of our 725 high school students are on the Honor Roll. Students who did not make Honor Roll sat in rapt attention and delivered boisterous applause for our students who did make Honor Roll. 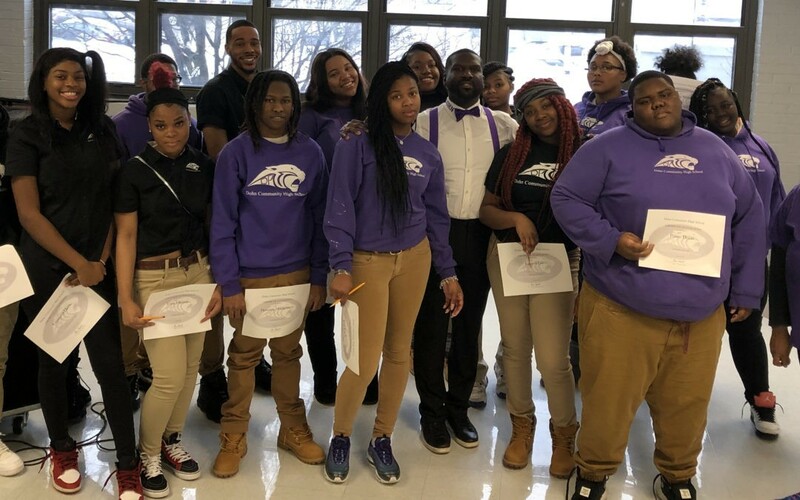 While Dohn remains a credit recovery school, we are fast becoming a school of the first choice for urban youth, because of the community our students are creating among themselves. Honor Roll students receive a Certificate of Achievement, and special time with our Director, when they talk about their plans with him. Dohn celebrates every single one of its students because they are in school, focusing and accomplishing, despite challenging life circumstances. Today, we have the chance to honor many of our students for their academic achievement. We hope you will join us in recognizing their accomplishment. A list of all Honor Roll students from our six high school locations is below, and a video of all our locations’ Honor Roll ceremonies is coming soon.